A lot of wonderful changes happened in 2015: I bought annual passes to Disneyland for my entire family, I quit my full-time 9-5 job at a bank to pursue my business full-time, my business started to grow, and my personal favorite (after, having the opportunity to spend more quality time with my family, of course), we got Featured on a wonderful wedding blog. I do expect 2016 to be soooo much busier. I have already booked 8 clients (and engagement season just started)! For me, that is a HUGE deal. I have been in the wedding industry for about ten years now and on my own for four years. Since starting my own event planning business I have never been THAT busy this early on. Which I don't mind at all. My goal is to get to at least 15 events in 2016 and then every year go up 3-5 more. This year, I decided I wanted my business to grow and I wanted my name to be known within my community. It is not easy to run a business and have an everyday office job. However, I was determined to make it happen. Poor my husband, He knows once I have set my mind to something, there is no way to change my mind and stop me. So, instead of stopping me, he encouraged me to work hard and quit my day job. He said "if that is what you truly want to do then I support you." Of course he didn't mind at all, because that meant I would be home more and pay more attention to our boys. Although, I like to think it's because he loves me. Whatever his reason to agreeing to my "all-of-the-sudden decision", I am ecstatic he did! I find myself busier than ever. I am replying to e-mails on a daily basis, spending a couple hours a day on social media, working on events I have already booked, and meeting prospective clients at least every two days. I find my self on a schedule: wake up, get kids ready for school, drop them off, come back reply to messages, work on SEO, blog, post on social media, Instagram and Facebook for a bit, then I realize it's time to start getting ready to pick up my Kindergartner. Afterwards, I do a bit of grocery shopping, start dinner, answer emails, plan a few weddings in between, eat dinner, family time, shower, go to bed and do it all over again. The highlights of my days is when I schedule meetings with clients (in between my chaos), when I meet other creative professionals for networking purposes, and definitely the quiet moment we share as we watch a movie as a family. 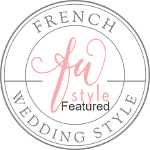 Speaking of meeting new creative entrepreneurs, did I mention that PSE got featured on French Wedding Style, along other creative and amazingly talented people. The best part, it was featured on Christmas Eve! It was an idea by the Teri, photographer, after a walk through a park and coming across some red berries growing in their natural environment. I had the honored to work on the flower arrangements for this styled shoot. The creative minds involved are : Myke & Teri Photography , Photography, Terroir Designs, Styling, Nicole Bakes Cakes, Cake and Macarons, Elena Collection, gowns and tutus, Fern and Bone, vintage rentals. It was a complete successful collaboration of a community of creative small business owners working making the world a little bit more beautiful. Please enjoy the following photos as we enjoyed working together to create it! !